A grandfather gets devastating news. His three-year-old grandson has just been beaten into a coma and will be taken off life support that evening. The man frantically books a last-minute flight from Los Angeles to Denver. He gets caught in traffic and security checks at the airport. His plane should already be in the sky. Yet when he gets to the gate, the pilot is waiting for him. A woman calls a grocery store in a panic. She’s worried that her 89-year-old father is snowed in and there’s no food in his house. The grocery store doesn’t run a delivery service. Yet groceries get delivered to his front door. There’s no delivery charge and the groceries are free for the World War II vet. So do these stories make you want to fly with Southwest Airlines and shop at Trader Joe’s? 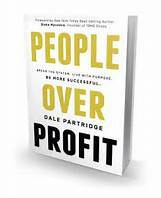 We crave companies that care, says author and entrepreneur Dale Partridge. And caring companies know that putting people over profit is actually more profitable. We open our wallets and stay loyal to businesses that we like, trust and respect. So what’s gone wrong with the companies that we love to hate? Partridge says these organizations have lost their way while worshipping efficiency above all else and feeding an addiction to growth at all costs. The founder’s guiding principles and commitments to quality and customer service get compromised. Standards slip. Promises are broken. Employees and customers get taken for granted. Authenticity attracts. Live your message. Practice what you preach. Be who you are. Quality speaks. Companies that care about the smallest details show customers that they care about them. Never settle for satisfactory. Courage sustains. Start putting people first by getting past the four fears of change, failure, admitting fault and the unknown. Whether you’re in a corner office or on the frontlines and working for a start-up or a major organization, you can decide what comes first in 2016. Will it be people or profit? You feel like an outsider at work. You expect to be called out at any moment and asked to clean out your desk and turn in your keys. After all, you’re in over your head. You’re making it up as you go along. You work with supremely confident and well-connected colleagues who always seem to know the score and are blessed with social graces and stellar pedigrees. Whatever success you’ve had can be chalked up to dumb luck and your career really isn’t all that impressive on close inspection. You’re suffering from an acute case of impostor syndrome. Ross McCammon, author of “Works Well With Others,” feels your pain and has a remedy. McCammon was editing Southwest Airlines’ inflight magazine in Texas when he was recruited to join Esquire magazine in New York City. It was a tough transition. And then McCammon discovered he wasn’t alone. “No matter how famous or important, everyone is just really weird and really nervous. Especially the people who don’t seem weird or nervous. It turns out you really should sweat the small stuff. It’s the stuff that no one ever talks about or teaches you in school. Yet you need to know how to shake hands and how to smile. You need to master the art of having business lunches in overpriced restaurants with important people and carrying out short yet meaningful conversations in elevators. You should be able to deliver speeches, raise a pint to toast your coworkers and make a graceful exit from office parties. And you may also want to shut up on social media. McCammon cites a 2014 survey where 51 per cent of employers found content on social media that caused them to take a pass on a job candidate. McCammon’s written a smart and self-deprecating survival guide for anyone who feels like an outsider at work and wants relief from workplace anxiety.